Samantha’s website is moving to a new address! You can go there now at http://www.samanthastclaire.com and say, Hi! I’d love to hear from you and receive your comments. The key change is .com instead of .net! Look for the next releases from Whitcomb Springs, “Tracking Amy”, “Retribution Road” and “Forsaken Trail”. All three will be available in April of 2018. Stay tuned for the latest news and opportunities to win one of these short stories. I’m so excited to be a part of this collaborative venture into creating stories for the fictional Montana town of Whitcomb Springs. Today we release the first two stories of that ongoing series set in a mountain valley in southern Montana. I’m sharing this release with award-winning author MK McClintock, the creator of this series. You can visit her site and learn more about her books as well as this series. Each story is a stand-alone read, but the residents do occasionally bump into each other. Enjoy learning more about each character throughout the series in surprising ways. It’s like an under-worked muscle. Many of us are born with it well-developed. As children we meet the world with eyes of wonder and imaginations ready to accept the impossible. We want to be awed. We know that beneath every rock we turn over is an exciting discovery. Until we stop exploring life with those eyes of wonder life is beautiful. When I snapped this picture, my initial thought was ‘how unfortunate for the poor pansy’. In the process of writing my new book, A Light From Friday Harbor, I’ve been reading and reflecting on the theme of hope. One recurring solution to hopelessness is the alteration of perspective. Sometimes we know it as attitude. For my character, Abby, dealing with diminished vision, the shift in perspective and diminished vision become metaphorical. How would Abby, with her striving for hope in a hopeless situation “view” this image? If we were to call up our memories of childhood wonder, might we see delight here? There has always been something childlike in the face of a pansy or a violet or a primrose. These early heralds of spring have pluck. The fact that they are small compared to their showier cousins, the roses, adds to that impression of fortitude. If I were to caption this photo now, as I practice positive perspectives like Abby, I think I would pick words like ‘Courage’ or even ‘Hope”. One of the few things we have control over in our brief time in this wonder-filled world is our attitude. Perhaps we’d be more mentally healthy working that muscle of perspective. Life might even become beautiful again. Wouldn’t that be a wonder? In the spring of 1865, a letter arrives in Whitcomb Springs for Evelyn Whitcomb. The Civil War has ended and the whereabouts of her husband is unknown, but she doesn’t give up hope. With courage, the help of a friend, and the love of a people, Evelyn finds a way to face—and endure—the unexpected. “Whitcomb Springs” is the introductory, stand-alone short story of the Whitcomb Springs series set in post-Civil War Montana. For a complete listing of all currently available and upcoming Whitcomb Springs stories, visit http://www.mkmcclintock.com/whitcomb-springs-series. The letter fluttered to the table. Evelyn stared at the sheet of paper but could no longer make out the words as they blurred together. Surrender. She prayed this day would come, they all had, and after four tortuous years, the war was finally over. There would be more capitulation on the part of the South, and too many families who would never see their men again . . . but it was over. Separated, yet not untouched, from conflict, Evelyn Whitcomb lived in the same town her husband and their two friends founded one year before news of the Civil War reached them. By way of her sister, who lived in Rose Valley, Pennsylvania with their parents, they were kept informed as often as Abigail could get a letter through. Evelyn often wondered if she should have returned to Rose Valley to help with the war effort, much as her sister Abigail had done, yet she found the needs of Whitcomb Springs to be vast as the town continued to grow. Many men and boys left, leaving their wives, mothers, and sisters behind to fight for a cause they didn’t fully understand, yet still felt it their duty to serve. Others remained behind to continue working in the mine and watch over those families with or without kin. Evelyn read over Abigail’s letter once more, letting the words settle into her mind, for even now she struggled to believe it was over—that her husband might return home. For too many years now I have shared with you the horrors and travesties befallen many of the young men with whom we spent our childhood. News has reached us that on the ninth of April, Robert E. Lee surrendered to Ulysses S. Grant at Appomattox Courthouse. Oh, sister, I dared not believe it was true when Papa brought home the news. He tells us not to become overly excited for there will surely be a few more battles waged until the news reaches both sides, but we can thank God that this war is officially over. Your news of Daniel’s disappearance has weighed heavy on my mind these past months since we heard, and Papa has attempted to learn of his whereabouts, to no avail. We have not given up! There is much confusion right now on both sides and Papa said it could be weeks or months more before the men return home. Do not lose faith, sweet Evie. MK McClintock is an award-winning author of historical romance and westerns, who has written several books and short stories, including the popular “Montana Gallagher” series, the “Crooked Creek” series, and the “British Agent” series. She continues the search for a time machine that can transport her to nineteenth-century Montana or Scotland—either works. MK enjoys a quiet life in the Rocky Mountains where she spins tales of romance, adventure, and mystery set in bygone times. If you’d like to know when MK’s next book will be out, please visit her website at www.mkmcclintock.com, where you can sign up to receive new release updates. To read an excerpt from Samantha St.Claire’s short story “Healing Fire” visit the Whitcomb Springs page on this website. The following post is a reprint of one I wrote several years ago on a different website. Reading it again this week, I felt it might be appropriate to post here. Michael Hauge often speaks of the protagonist’s search for his essence. It’s an essential element of the hero’s tale. The hero lives in denial for a period of time, clinging to what he knows to be true of himself, or rather what he believes to be true of himself. The story reveals his essence which opposes that perception, and while the reader sees the reality, the protagonist must discover that truth along his own painful journey. I’ve also read that each of us must make that painful transition or languish in our delusions, never satisfied. Looking back at my own career path, I can see the truth of this. That path has been filled with some interesting switchbacks. That is the universal story, and I’m only living out one version. One major switchback or plot twist occurred early in my life. I’ve spoken of it in an earlier post. The fact that this event continues to come to mind reveals its significance. In love with the process of creating, at the time manifesting itself in the visual arts, my path seemed straight and clear. I would pursue my passion, seeking out those who could teach me the skills I needed to succeed. Unfortunately, the teacher I encountered would not take the role of mentor. Although she was not an antagonist she did become an obstacle. Young and perhaps threatened by her inexperience, she asserted her opinion that what I lacked to become successful was talent. Such a judgement, from one to whom an impressionable youth looks for guidance, was and is devastating. Although it altered my career path as a result, the experience shaped me for the better. Later in life, when I ironically found myself in the position of art teacher for a small private school, I made a commitment to encourage my students and refrain from opinions on their talents. While I see myself as a teacher of students in the arts, I refuse to think of myself as an artist. I still believe I lack the talent. Along the way, I met a wonderful teacher of ceramic art. He was the C.S. Lewis of potters for his time. Students thrived under his instruction. We aspired to be like him and learn all we could from his vast years of experience. He taught us the chemistry of glaze creations, but he taught us so much more. Never allowing us to keep anything we had made on a potter’s wheel unless it was 12 inches high, he taught us discipline and to pursue excellence in our craft. To me, he gave words that began to undo the damage of that youthful teacher from my past. He said that to become an excellent potter was more about skill than talent. Oh what a revelation! Here was an excuse for me to continue to pursue my essence, just in a different medium. So I did. Thank you, Martha, from the bottom of my anxious heart. She goes on to challenge her audience to pursue the craft diligently, finding our weaknesses and our strengths. I’m bent over my keyboard now just as I was bent over my potter’s wheel for so many years. Pursuing excellence in the craft is something I can aspire to do. Putting aside my fears of public opinion, I am following my essence. It’s what I must do. Happily, it’s also what I want to do in this chapter of my own hero’s tale. So here’s the question? Is talent like art simply in the mind of the beholder? My perspective now is this. I have to pursue the craft as if I am pursuing my essence and leave the opinions to others. While I want readers to love my characters and settings as much as I do, I must only concern myself with crafting the best story I can. Of course, that is easier said than done. I’d welcome observations and experiences in expressing your own creativity. Once one really begins to look for the stories, they appear along every trail and byway. Sometimes they take you by surprise even when you aren’t looking. That happened last weekend here on the farthest NW corner of the contiguous 48 states while we were hiking one leg of the amazing loop trail from Lake Ozette to the the coast. We stumbled upon the remains of a homestead after meandering through the Ewok country of the Olympic National Park. Stumbled is not a mere literary affectation. While we were hiking west, nearly to Cape Alava, a young couple told us of the homestead just off the boardwalk. On our return we looked for the small opening leading north off the main trail. It wasn’t obvious, but a narrow path did appear. Looking more like an animal trail at first, we were a little uncertain that we’d found what we sought. We had just heard a bull elk bugle off to the south making us a little jumpy about trekking too far off the trail. After a few steps, the ground showed clear signs of recent human tracks. Expecting the “homestead” to be little more than ruins, we nearly turned back. Then, through the trees, the structure rose up like the “Shack” from novel and movie fame. Creepy and wonderful at the same time, it invited investigation so we made our way up the gentle rise to the front door. Our first thoughts were to marvel at Washington’s seemingly casual attitude toward allowing the public to explore such historic sites. No fences surrounded the one-story building and only one small sign gave us stern warning not to deface the property. What remains of Lars Ahlstrom’s shack at the edge of the prairie is a single room with loft. History reports he had a fine house once, but it was destroyed by a fire that grew out-of-control when his friend and neighbor attempted to clear the prairie of brush. The forest is reclaiming the land, encroaching on the house walls. But it stands quite confident in itself. Such a discovery for a writer is the stuff of inspiration. My stories have been rooted in Idaho, Montana and Wyoming. Until seeing the house and since learning of the history of this area there was little to inspire my muse. This Scandinavian community thrived at the same time as the stories I’m writing. I can imagine it now. And there were love stories. Of course, there were. Faith, hope and love are interwoven into the human experience. At one time, the land surrounding Ozette was home to not only the Makah but 130 homesteaders. They thrived in relative isolation, clearing the land by burning trees and brush, growing crops and raising livestock. By the time they abandoned their dreams and left the lake community, they had constructed a church, a school, three post offices and stores. All came to an end when in 1909 President Theodore Roosevelt decreed the land should be used as part of the Mount Olympus National Monument. But the love story? That is worthy of further research. Conflicting reports exist of the mysterious disappearance of handsome boat-builder, Alfred Nyland. The accounts of the discovery of his skeleton eleven years later agree, but the reason for his sudden departure vary. One report explains how his boat was found floating in Erikson Bay after his disappearance in April. The story proposes that he lost his way as he returned home through the woods. It’s certainly plausible when one sees the density of the forest. The second report includes the personal tragedy of a love for a woman who rejected Alfred’s offer of marriage. Some suggest that sorrow sent him into the woods to seek consolation. Those who know the answer are forever silent. The fact that he was found, back against that tree with his hand over his chest, makes one wonder. Did he die of a broken heart as this story proposes? Love and loss – dreams and failed expectations – hardship and courage. All are strong elements for story and character arcs. Heady stuff for a writer’s soul. Click here for a link to About page to signup to claim your free book. Those words begin an observation made by John Muir. Most of us who have spent any time in the mountains know the truth of this sentiment. On a family trip to central Idaho’s majestic mountains, we traveled north from Ketchum along the 75 through some of the most breathtakingly beautiful scenery God ever designed. Along Idaho’s volcanic spine are scattered numerous hot springs. Some are better known than others. We visited one a few miles north of Sun Valley that fits into the category of better-known. A sign directed us to the spring that has been commercialized for years, boasting a swimming pool at a consistent bath temperature. We passed on the experience of bathing with a bus-load of excited, splashing children. Our interest peaked, we too leaned in to accept this conspiracy of information. Giving us clear directions, he explained that it was once known as Sheepherders’ Bath. That name didn’t stick for Google, but the locals still refer to it as such. Just as the miners of the late nineteenth century used the numerous warm springs to wash off the week’s settlement of dust and grime, so the sheepherders of the early twentieth century took comfort in the thermal waters. Convenient to their grazing grounds, the shepherds availed themselves of nature’s provision. We drove the short distance where we found the spring just as described. No hordes splashed in it’s crystal waters. As though we were alone in the wilderness, we stepped into the 80 degree waters. With a view of the mountains to the east, we could imagine John Muir himself, walking with stick in hand, a flock of sheep trailing behind, walking asking to share the healing waters. We’d have willingly made room so that we might together wash our spirits clean. One log structure remains near Beaver Creek. Comes the Winter is another sweet historical fiction set on the eastern side of the Sawtooth Range. In 1886, Alena Sommers arrives to the boom town of Sawtooth City expecting to begin a new life with a man she hasn’t met. Together they were to operate a lodging house, more correctly considered a partnership than a romance. But her future takes a sharp turn when the man who was to be her husband dies before she sets foot in Idaho Territory. This summer I visited the site of Sawtooth City. Not much remains, some rock foundations scattered here and there across a narrow valley. Just a few miles off Highway 75, it can be found quite easily by driving down a gentle dirt road that winds along Beaver Creek. That ease of access probably explains why so little remains of the once thriving mining community. There are a few stone foundations, evidence of fireplaces here and there. We were there shortly after the snow melt flooded the rivers and streams of Idaho. Beaver Creek rambled, split, and came together again in lively pathways. It’s been reforested, making it a little more difficult to imagine the saloons, boarding houses and restaurants that written accounts and a few grainy black and white images prove were here. Still, the setting came alive after we found one partial log wall near the stream. The window and door frames were evident. It might have been a nice place for a lodging house. It was a perfect summer day, lupine and yarrow dressed the tall grasses. Searching for anything that bore witness to the city existence made for a pleasant few hours. Reluctantly, we drove out of the valley, east to the main road. My husband had seen a notation on Google Maps of a cemetery. A little more than a mile beyond the last foundation a narrow forest road let to the top of a knoll with a view to Beaver Creek. I would imagine Sawtooth City would have been visible as well. We found the rustic remains of wooden crosses, nearly lost in tall grass. The crosses were in random positions close together. No names survived the years of weathering. People who came to strike it rich never returned home. Lonely as it is, the site is peaceful and I could imagine Evan sitting beside his brother’s grave admiring the view. Driving west toward Sawtooth City. This post by Mike Torreano, hosted by M.K. Tod, should resonate with all writers of historical fiction. I met Mike Torreano at the 2015 HNS conference in Denver and chatted about our preferred time periods and the careers we had before becoming obsessed with writing. Mike’s novel The Reckoning – a post civil war mystery – has just released from The Wild Rose Press. Today Mike talks about writing a western and the Code of the West. Over to you, Mike. 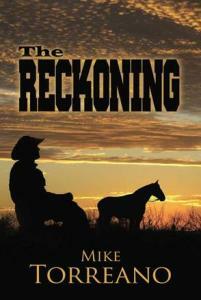 So my western mystery, The Reckoning, was just released by The Wild Rose Press. It takes place in 1868 and is the story of Ike McAlister, a Union soldier who returns from the Civil War to his hometown of Lawrence, Kansas to find that his parents have been killed by Quantrill’s raiders. He sets out on a single-minded hunt to find the killers, a search which takes him to the high plains of Colorado.